Using data from the Illinois Water Inventory Program, scientists at the Illinois State Water Survey have developed an interactive map of where every community in Illinois gets their water from. Sources of water throughout the state include Lake Michigan, inland surface waters such as rivers and reservoirs, groundwater, or a combination of sources. Communities either self-supply their water or buy water from other communities or public water distributors. 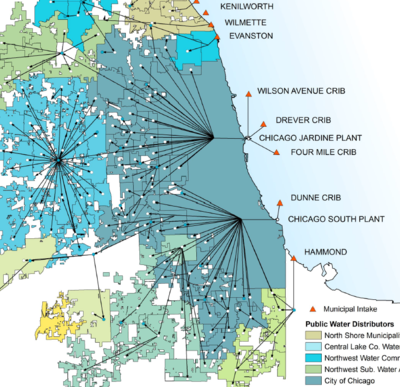 The web of water purchases is quite complex, particularly for Lake Michigan users. Sometimes water is bought and resold and can pass through many facilities before making its way to its final destination. A version of this map has also been featured in a recent Chicago Tribune Investigation, which discusses the complexity of Lake Michigan water distribution and rates. The interactive map is a snapshot for the year 2012, but the Illinois State Water Survey intends to update the map in the near future. The data for the map can also be downloaded as a zip file of GIS data or as a large format PDF.